Bringing Concepts to Life ! Cleaning is the process of removing foreign bodies from objects and is normally accomplished using water with detergents or enzymatic products. In the healthcare industry, automatic cleaning process is accomplished by washer disinfectors. Washer disinfectors are designed to wash and disinfect specific medical utensils, surgical instruments and other healthcare equipment. Washer disinfectors are used in healthcare industry to either prepare goods for future sterilization, to remove residues from surgical products, or to disinfect goods for later use. Surgical instruments should be presoaked or rinsed with water, to prevent drying of blood and to remove blood from the instruments. After a complete washer disinfection cycle, the instruments can be inspected, placed in sealed sterilization pouches or wraps for autoclaving process. In-depth cleaning of instruments is required before disinfection and sterilization because dried materials, organic or inorganic, that remain on the surfaces of instruments hamper the effectiveness of these processes. The rack decides the chamber capacity of the washer disinfector and can have a significant impact of the cleaning ability of the machine itself. Within every rack is a retained internal volume of up to 5L depending on the design of the machine. An optimum number of racks will help to further reduce the volume of water required per phase and hence also reduce the energy and detergent consumed. Having a greater capacity per rack enables more trays to be process per load. This in turn can reduce the number of times a washer needs to run during the day thereby improving efficiencies and lowering costs across the board. The three reasons a washer disinfector consumes water – rinse with water, wash with detergent and water and disinfect with water. With depleting resources and increasing reliability on them. It is important to leave our resources for the future generations. That our sterilizer does not utilize the greatest volume of water per cycle consumed during sterilization process. The washer-disinfectors may be equipped with two heating systems, steam and electrical, for optimal reliability, manual or automatic switching between both systems may be performed at any time. This provides backup to minimize any bottlenecks when the steam supply goes down. The machine should have minimum energy consumption. When the machine is idle, the washer-disinfector can be programmed to switch off and only come back on when needed, to further save energy. Washer disinfectors are required to frequently heat water to near boiling point in order to achieve thermal disinfection within the stipulated time period. The time is a critical factor because all the microorganisms do not die off at the same time, thus increasing the cycle time. This minimum exposure time is the least required time for a complete washing cycle. At the end of the cycle, time is required to heat the air used to dry the load and contributing to the time cycle of the washer disinfector. In today’s fast-moving world, it is necessary to have short sterilization cycles as this will improve the turnaround time for the medical equipment which will result in less hospital inventory thus decreasing the space requirement in the hospital. With a washer disinfector, the instruments are washed and disinfected properly with every cycle. Over an average hour-long cycle (although with advanced technology, machines can perform an entire cycle in about 35 minutes), the machine automatically changes phases from flushing and washing to rinsing, disinfecting and drying. Automatic washer disinfectors ensure minimal human contact with contaminated instruments means staff is protected from the risk of sharps injuries and eye splash incidents due to manual cleaning and rinsing. At the end of each cycle, all the instruments have been flushed of resistant contaminants such as blood, tissues and bone fragments. Medical instruments are also washed with detergents that preserve instruments against degradation and disinfected thermally in water at temperatures of approximately 80-90 degrees Celsius. All of this, with negligible time or labor from your staff – so they are better able to focus on offering the highest level of care to your patients. The effectiveness of high-level disinfection and sterilization mandates effective cleaning, patient safety and minimizes hospital acquired infection. Central Sterile Supply Department (CSSD) is a service unit in a hospital that processes, controls the sterile stores supply to all departments of the hospital. The essentials of this department are correct design, appropriate equipments, skillful operators and a unidirectional work flow. What are the functions of a CSSD? What are common Sterilization Techniques? Personnel in CSSD comprises of a Supervisor who may be a nurse followed by other staff like chief, assistant, technicians, aides, orderlies and messengers that get trained on the job. Reception control and disinfection area. Staff changing room , lockers, toilets. Clean work area required to for preparing special instruments, testing instruments, equipments, linens, assembling treatment trays and linen packs, and for preparing materials for sterilization. Assembly area required for medical- surgical treatment packs, sets and trays. Work bench with multiple drawers for instruments and suppliers are necessary. Double door, pass- through autoclaves. Sterile store and adequate space for loaded sterilizer carts. Provision for supply of steam, hot and cold water and other utilities and services. OT lights are the most prominent aid parallel with the surgical equipments for medical practitioners. They are used by clinicians, surgeons and proceduralists in emergency rooms, labor and delivery, examination room, etc. OT light is a medical device intended to illuminate a local area or cavity of the patient to assist medical practitioners during a surgical procedure. It is very essential to provide an excellent source of light during various medical procedures like dental treatment, surgery, examination rooms etc. Hence, they must be designed in a favorable manner as it is extremely critical for staff comfort and patient’s safety. OT lights can be categorized by lamp type or mounting configuration. Two lamp types are conventional (halogen) and LED (light emitting diode). 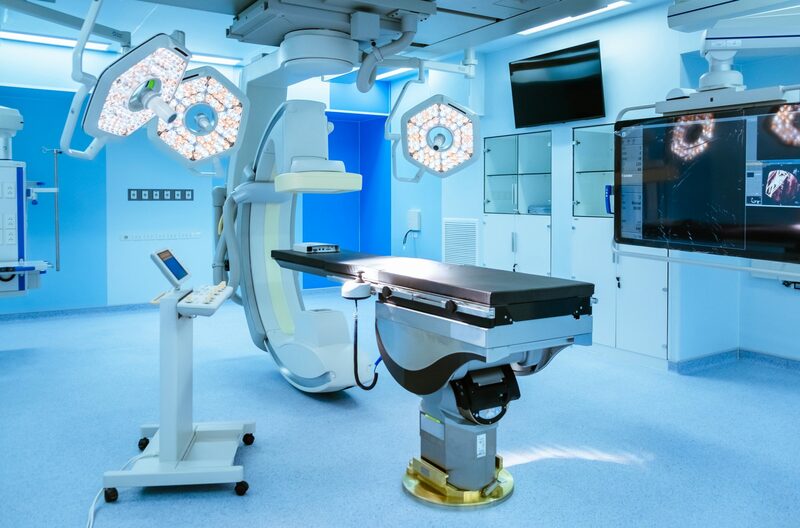 Because surgical lighting is complex, sophisticated and often customized for an operating room an efficient illumination needs adequate balance of luminance, temperature, weight and shadow management. Considering these factors will effectively reduce errors and minimize eye fatigue, a main factor in performing successful and safe procedures. Lux: Unit for the amount of visible light measured by a luxmeter at a certain point. Central illuminance (Ec): Illuminance (measured in lux) at 1m distance from the light emitting surface in the light field center. Light field center : Point in the light field (lighted area) where illuminance reaches maximum lux intensity. It is the reference point for most measurements. Shadow dilution: The light’s ability to minimize the effect of obstructions. (D10): Diameter of light field around the light field center, ending where the illuminance reaches 10% of Ec. The value reported is the average of four different cross sections through the light field center. D50: Diameter of light field around the light field center, ending where the illuminance reaches 50% of Ec. The value reported is the average of four different cross sections through the light field center. Heat Management: Light will be always energy so in order to prevent from tissue desiccation, a safe heat management is mandatory. Heat can be measured in two places: at the light patch, and at the light head. Heat can cause discomfort for the surgeon, and can dry exposed patient tissue. A quality surgical light will minimize heat to improve comfort and patient outcomes. Operating Theaters are changing as technological advances expand the possibilities of what can be achieved within the sterile environment. The working environment for medical staff such as doctors and nurses must be considered from the viewpoint of human engineering. Modular operation theater is a designing approach using standardized units for easy construction and flexible arrangement. What does the future of Modular OT hold? With new technology coming in so fast, advancement of Modular OT is already on its way. The new concept preferred by healthcare professionals, architects and designers is Glass Modular OT. The material glass is known for already 9,000 years but especially today belongs to the most modern solutions for customers who emphasize hygiene, safety and design. There are nearly no limits neither in processing nor in design. An Operating Theater is a facility within a hospital where surgical operations are carried out in an aseptic environment. Being one of the biggest and busiest departments within a hospital, it thus makes it one of the most critical departments as well. The best location for the surgical department is one which permits a convenient and uncomplicated flow of patients, staff and clean supplies traffic. The OT should be located that there will be no traffic through it and no interference from the activities of other departments. Regarding services, ideal adjacencies would be emergency, radiology, clinical laboratories, intensive care units and central sterile and supply department. While planning and equipping each operating room, a series of questions need to be answered. They relate to size, usage, lighting, intercommunication and signal systems, electronic equipment and monitoring system, medical gas system and other service lines, fixtures, safety precautions such as grounding for X-Ray, TV camera and against static electricity, storage, supply cabinets, environmental control, etc. Additional space is required for the infrastructure and electronics to support the components outside the OT. In the current scenario of evidence based medicine, it is imperative to give maximum importance to planning an Operation Theatre. Within the limitations of finance and space, the best results can be obtained by consulting healthcare professionals. Efforts should be made to conform to the standards laid down by local bodies and international agencies, as healthcare facilities in India are now catering to more international patients. The latest of AI technology replicates human intelligence in machines. The ability to adapt to changing social discourse, is the new boom in this field of innovation. Siri is a form of AI entering our daily life. If not already, Artificial Intelligence will soon enter the biotech industry. Cold-chain supply shipments require careful measuring and monitoring of its content’s temperature, pressure, tilt level, tamper detection, and much more. Even the slightest change in the variables can lead to the vain output of the product. From the warehouse to the delivery station, AI can be integrated to enhance each stage’s productivity and cost-effectiveness. In the warehouse, AI can perform visual inspection process, where it scans images of the shipment, to ensure no damage has been done to the packages that are going to be transported. To minimize such damage and ensure quick delivery of products from first mile to last mile, cloud-based platforms can be set up allowing access to all stakeholders (consumers, manufactures, delivery heads) for sensor data of the shipment. The AI will be performing comprehensive analysis and provides info to the end user about the product (basic manufacturing information, safety compliances). Manufactures will be able to take instant measures form smart devices/ control panel. Furthermore, AI can analyze the cost-data sheets to create a magical bridge for suppliers to enhance their supply chain management productivity. (‘Morgan’). AI technology will further provide instantaneous route changes to the destination for the quickest route available and for the time/ day the shipment should be moved according to different requirements for each drug/ food product and weather conditions. AI is a novel technology in today’s world that can save billions of dollars; however, if this gold coin is not shined regularly, it can lose its value. By-Anoushka Kabra, Intern at Lifeplan Technical Solutions. Morgan, Blake. “5 Examples Of How AI Can Be Used Across The Supply Chain.” Forbes, Forbes Magazine, 19 Sept. 2018, www.forbes.com/sites/blakemorgan/2018/09/17/5-examples-of-how-ai-can-be-used-across-the-supply-chain/. An operating table is a table on which a patient lies during a surgical procedure. The purpose is to keep the patient in place while the surgical team operates, and may move various parts of the body using their accessories for easier access to the surgical site. They are typically used within an operating room, ambulatory surgery center, primary health care centers or other healthcare facilities, where surgeries are performed. Operating tables are used in various types of procedures such as cardio-thoracic, orthopedic, bariatric, robotic, urology, and more. 1.What kind of procedures will be performed in the surgical suite? A specialty hospital operation table has different needs than a general hospital operating table, performing a variety of surgeries, including Trendelenburg, lateral, prone,C-arm support for fluoroscopy and many more features. Hospitals that specialize in neurology, orthopedics, urology, bariatric surgeries should prefer a table designed specifically for that procedure. Thus, general operating tables cannot offer the features required for specialized surgeries but are cost efficient and can fit in for every price range. 2.What Basic Features Are Important to You? When you’re selecting a surgical table, there are some key characteristics you should look for in any model. These features should meet all the demands of the operating room and the surgeons. An optimized operating table can improve workflow and facilitate the use of all the available features. The features can include comfortable access to the patient’s incision site, monitor accessibility, the ability to safely position the patient as needed, and the flexibility of taking images of the patient quickly and easily during surgery. The table should be made of radiolucent material, meaning X-Rays can see through it. 3.Do you want a Stationary or a Mobile Operating Table? A stationary operating table features a table column that is securely anchored to the floor. Usually a fixed surgical table will have a variety of specialty top sections which can be removed or added as required, depending on what procedure is being performed. A mobile operating table can be used in any size facility, and they are by far the most popular option. 4.Should you go for an hydraulic OT table or a motorized Table? 5.What Height and Weight Range do you need? To meet the ergonomic requirements of the surgeon and other operating staff, an adjustable table is a necessity. Most current operating tables have adjustability ranging from 73 cm to 122 cm. Earlier, only hospitals specializing in bariatric surgery needed bariatric tables. However, with the changing lifestyle and unhealthy food habits, a table able to accommodate larger patients is a wise investment. Obese people are more likely to suffer from serious health problems such heart disease, high blood pressure, stroke, and cancer — making them frequent consumers of healthcare services. 6. What is your budget for the operating table? With products available at almost any price point, it can be difficult to make smart purchasing decisions that support the efficiency, growth and success of your hospital and meet the needs of your surgical suite. A high-quality specialty surgery table can cost up to three times as much as a general surgery table, so consider your needs carefully to avoid spending money unnecessarily.